Time for pool parties, barbecues, and other gatherings where showing up empty-handed is frowned upon. 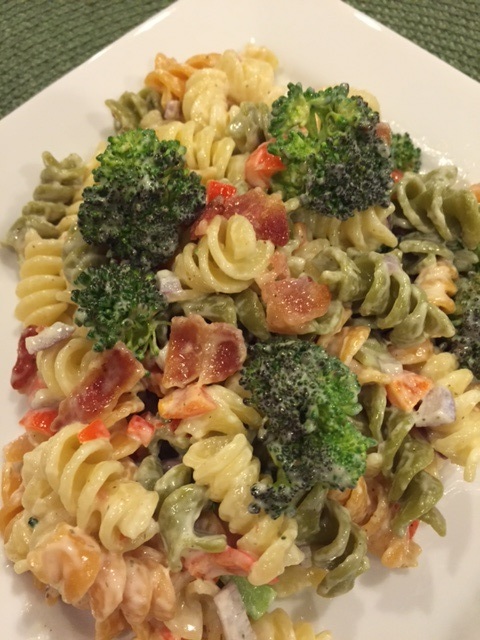 This pasta salad is awesome as a side. Add grilled chicken and it’s a meal. You can vary the ingredients, but I wouldn’t omit the bacon. Unless you’re a vegetarian. Or you’re satisfied with things at half-flavor. In other words, ditch the broccoli. Keep the bacon. Mix together the first five ingredients in a large bowl. Stir together the ingredients for the dressing in a separate bowl. Pour the dressing mixture over the pasta and stir. Chill for a couple of hours or overnight.